A restaurant, an outdoor pool, and a bar/lounge are available at this smoke-free hotel. Additionally, conference space, a children's pool, and dry cleaning are onsite. All 116 rooms provide free WiFi, balconies or patios, and TVs. Guests will also find coffee makers, ceiling fans, and hair dryers. 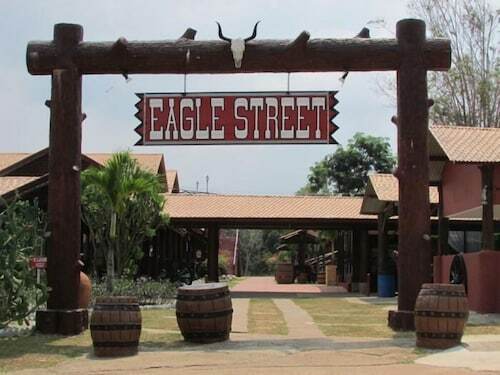 Eagle Ranch Resort features an outdoor pool and a children's pool. The hotel offers a restaurant. A bar/lounge is on site where guests can unwind with a drink. This business-friendly hotel also offers an arcade/game room, dry cleaning/laundry services, and a grocery/convenience store. Watering Hole - This restaurant serves breakfast, lunch, and dinner. Guests can enjoy drinks at the bar. Open daily.